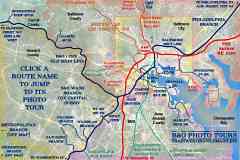 Virtual tours of the Baltimore and Ohio (now CSX) railroad, plus others in the region. 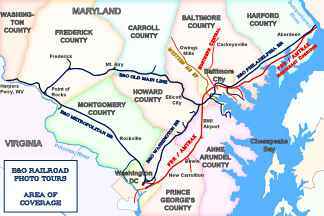 The OML is the route of the first commercial railroad in the USA as it pushed west from Baltimore, Maryland to the Ohio River. It was constructed largely by hand between 1828 and 1835, and amazingly, continues in active railroading use even now. 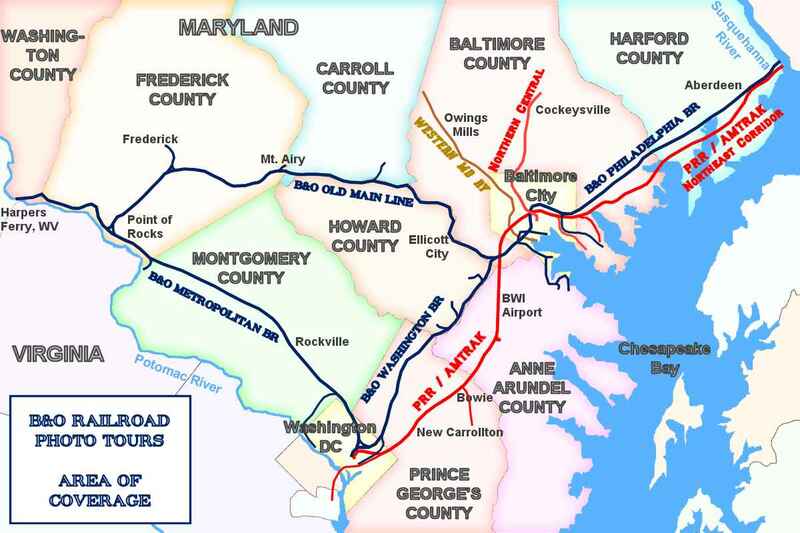 The B&O Washington Branch (now CSX Capital Subdivision) splits from the Old Main Line in Relay and extends to Washington, DC. It was built around 1835, but contains fewer surviving relics than the OML. The route is busier and less scenic. to Weverton, MD. This tour continues to Harpers Ferry, WV as the Cumberland Subdivision. mp 118 Bowie Race Track Branch - coming May 2019? COPYRIGHT NOTICE - Unless otherwise credited to or courtesy of, all Content (text and images) on the pages linked above are © Copyright 1999, 2019 by Intersystem Concepts, Inc. (ICI). Not including photos credited to or courtesy of a third-party, permission is granted to copy and reuse up to 10 ICI Content elements (i.e. up to 10 ICI images with or without its accompanying text, within any individual author's one book / web site / etc.) provided 1) no fee is charged for the items which include it, 2) our original copyright is preserved, and 3) we are credited as the source as follows "Photos and/or text Copyright Intersystem Concepts, Inc. Used with permission. See trainweb.org/oldmainline". This limited permission means any page within a book / web site / etc. that includes such a Content element must on the same page display that credit; copying Content to Wikipedia or similar multi-author works is not permitted. Except as noted otherwise, pre-1980 aerial photos courtesy Johns Hopkins University. Photos credited to or courtesy of a third-party may not be copied and/or reused elsewhere without permission of the third party. For other use or higher quality/resolution copies of any ICI photos, please contact us (fees reasonable). This is not a stock photo site, but we may have something you can use. Some photos on these pages are of The B&O Railroad Museum Collection. I'm a B&O Museum member; it's a great place, consider joining. The B&O RR Photo Tours site is not affiliated with the B&O Railroad Museum or CSX Transportation.